I know…I know. 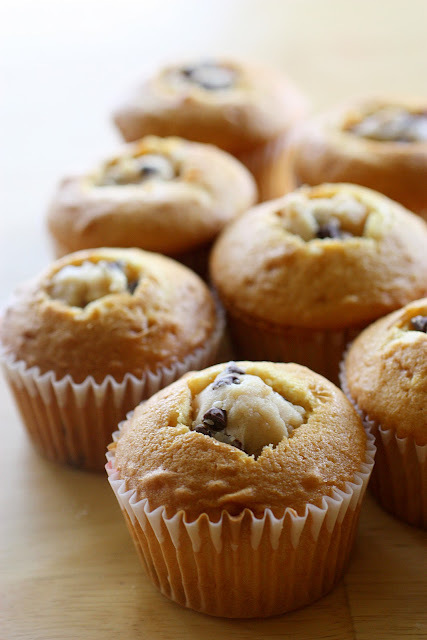 I just posted these Chocolate Chip Cookie Dough Stuffed Cupcakes but these are kind of like a sister to those. I love those cupcakes but I don’t always have time to do all three components from scratch. John brought some cookie dough stuffed cupcakes home from work a couple of times and so I tried to recreate that recipe with some shortcuts using a cake mix but you still get that cookie dough flavor but with gooey chocolate frosting on top. And do I think I have room in my life for two decadent cookie dough cupcakes? Yeeesss, ma’am. John made sure they were stuffed to capacity. He lifted each cupcake to make sure it passed the weight test and if it was too light he stuffed in more cookie dough. Preheat oven to 350 degrees. Line cupcake pan with cupcake liners. Make cupcake batter according to directions. Bake cupcakes according to package directions. Let cool. To make the cookie dough filling, with a mixer, cream together the butter and sugar at medium speed. Add the vanilla and beat well. Add the flour and salt and mix until combined. Add the milk gradually until desired consistency is reached and beat until fluffy. Gently fold in chocolate chips. Chill in the refrigerator until firm. To fill the cupcakes, cut a cylinder shaped portion out of the center of each cupcake. An apple corer works great for this. I found this a little tricky to get the hole out but then you get to eat what you take out! Fill each hole with a chunk of the chilled cookie dough mixture. Frost cupcakes with chocolate frosting. I like to put the frosting in a plastic storage bag and snip off a nickel sized hole in one of the corners to pipe the frosting on in a cone shape. Garnish with mini chocolate chips and mini chocolate chip cookies (See tip below). 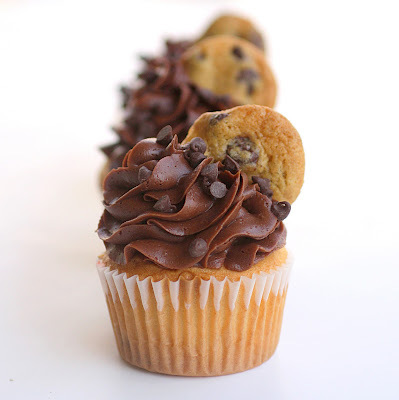 To fancy up your cupcakes, garnish with mini chocolate chip cookies. I used 1/4 of a package of refrigerated cookie dough. I placed nickel sized balls of dough on a cookie sheet and baked for 8-9 minutes at 350 degrees. This recipe looks delicious! I’d like to make it this weekend for a get together, but am slightly worried about eating uncooked flour as I’ve been reading this can be dangerous. I’d like to hear your thoughts and if there is something I can do to “cook” the flour. Thanks! You could bake the flour on a baking sheet for 20 minutes. hi again! what can i use instead of mini chocolate chips? You can use regular chocolate chips, toffee bits, or really anything? M&Ms? Yes, or just use a butter knife and make a cone shape. Whatever works! I’m gonna have to try this recipe, I had one similar but it said to roll cookie dough into tablespoon size balls and put in freezer for 2 hours and then when you put the batter in the cupcake liners drop a frozen ball on top and then bake for 20 minutes if you do that then the cookie dough ball melts down to nothing, if you bake less time so the dough doesn’t disinegrate then the cupcake isn’t baked through, after 2 attemps I’m frustrated and will try this recipe instead next time. I’ve tried that version too and it never worked like I wanted. I will remember to bookmark your blog and will often come back sometime soon. Thanks for the great recipe! I made these for my husband’s Christmas party at work. They one first prize in the cupcake contest! I can’t wait to try it with chocolate cake mix. I really want to make these for my friend’s birthday party, does anyone know how many cupcakes this recipe makes? This recipe makes around 18-24 cupcakes depending how big you make them. Thanks for the great recipe. We featured this recipe in a recipe food trend blog we just wrote on stuffed cupcakes. These were a big hit with my roller derby team. I also used the insides of the cupcakes to make cake balls (which were a big hit with me!). Thanks for the awesome recipe. I am a fan of anything with Betty Crocker frosting. When they first started selling it in Australia about 6 years ago, my friend Paula and I were both working in a supermarket and we used to eat our way through a tub of frosting together on our break. So bad, but so good! 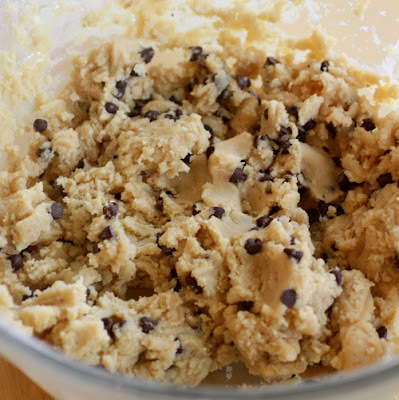 I’ve never been a fan of anything coockie dough but I would definitely like to try these! Definitely throw them in the fridge if the dough has raw eggs in it. If I wanted to store these overnight should I put them back in the fridge or leave them out? My cookie dough has raw eggs in them. Ohh….my….gosh. I have to try this. AWESOME blog, btw. Blessings! These are full size cupcakes and the recipe makes around 24 cupcakes. They are pretty fabulous I must say! Are these mini-cupcakes or “regular” sized? About how many cupcakes do you get out of each recipe? I’m thinking about making these for a BBQ. My only other question is WHY haven’t I had these before now? Just finished stuffing these babies and ready to frost. Hope the kids at the YCL meeting are as excited as I am about them! Thank you Christy!! It’s all about the tip. I went to Michael’s and looked for the biggest flower or star tip I could find which was this Wilton 2D (here’s what it looks like: http://www.wilton.com/store/site/product.cfm?sku=402-2004). I stuff it in a pastry bag or ziploc bag with the end cut off. I start on the outside and spiral in a circle in a cone shape. Does that help at all? Wow! These look beyond delicious! Can’t wait to get into my kitchen!